Three kings pay homage to the Christ Child, who in turn makes a sign of blessing. Jesus Christ, his mother the Virgin Mary, and Mary's husband Joseph have haloes and wear simple garments, while the Magi are dressed in exotic clothing and jewels and bear exquisite gifts. Caspar, bearded and bareheaded, presents the Christ Child with a rare Chinese cup, made of delicate porcelain and filled with gold coins. Melchior, the younger, bearded king behind Caspar, holds a Turkish censer for perfuming the air with incense; on the right, Balthasar the Moor carries a covered cup made of agate. Andrea Mantegna's composition of figures and objects compressed within a shallow space was based on his study of ancient Roman reliefs. He used a neutral background and sharply defined details to focus the viewer's attention on the kings' adoration of Christ. Louisa Caroline Stewart-Mackenzie Baring, baroness Ashburton, 1827 - 1903 (Grange Park, Hampshire, England), by inheritance to her grandson, Spencer Douglas Compton, 1903. Lord Spencer Douglas Compton, 1893 - 1915 (Castle Ashby, Northamptonshire, England), by inheritance to his elder brother, William Bingham Compton, 1915. William Bingham Compton, sixth marquess of Northampton, 1885 - 1978 (Castle Ashby, Northamptonshire, England), by inheritance to his son, Spencer Douglas David Compton, 1978. Exhibition of the Works of the Old Masters [...], exh. cat. (London: Royal Academy of Arts, with William Clowes & Sons, 1871), p. 27, no. 287, as "The Wise Man's Offerings.". Exhibition of Venetian Art, exh. cat. (London: The New Gallery, 1894), p. 5, no. 22. Berenson, Bernard. Venetian Painting, Chiefly Before Titian, at the Exhibition of Venetian Art, the New Gallery (London: Vacher & Sons, 1895), pp. 7-8. Kristeller, Paul. Andrea Mantegna (London: Longmans, Green, and Co., 1901), pp. 145-46, 438-39, no. 12, pl. 6. Yriarte, Charles. Mantegna: Sa vie, sa maison, son tombeau: Son oeuvre dans les musées et les collections (Paris: J. Rothschild, 1901), pp. 211-12, ill. facing p. 144. Berenson, Bernard. “Venetian Painting, Chiefly Before Titian, at the Exhibition of Venetian Art” (1895). Repr. in Bernard Berenson, The Study and Criticism of Italian Art. 2nd ed. (London: George Bell and Sons, 1903), pp. 95-96. Fry, Roger. "Mantegna as a Mystic." Burlington Magazine 8 (October 1905-March 1906), p. 92, pl. 3. Knapp, F. Andrea Mantegna: Der Meisters Gemälde und Kupferstiche. 2nd ed. (Berlin and Leipzig: Deutsche Verlags-Anstalt Stutgart, 1924), pp. xlviii, xlix, 183, 186, fig. 129. Berenson, Bernard. Catalogue of Paintings and Some Art Objects. Vol. 1, Italian Paintings (Philadelphia: John G. Johnson Collection, 1913), pp. 135-36. Venturi, Adolfo. Storia dell'Arte Italiana. Vol. 7, La Pittura del Quattrocento Parte III (Milan: Editore Libraio Della Real Casa, 1914), p. 476. Balniel, Lord, and Kenneth Clark, eds. A Commemorative Catalogue of the Exhibition of Italian Art Held in the Galleries of the Royal Academy, Burlington House. 2 vols. (London: Royal Academy, Burlington House, with Oxford University Press, 1931), vol. 1, p. 63. Balniel, Lord, and Kenneth Clark, eds. A Commemorative Catalogue of the Exhibition of Italian Art Held in the Galleries of the Royal Academy, Burlington House. 2 vols. (London: Royal Academy, Burlington House, with Oxford University Press, 1931), vol. 2, no. 184, ill.
Berenson, Bernard. Italian Pictures of the Renaissance: A List of the Principal Artists and Their Works with an Index of Places. 2 vols. (Oxford: Clarendon Press, 1932), p. 328. Fiocco, Giuseppe. Mantegna (Milan: Ulrico Hoepli, 1937), pp. 68, 206, 226, fig. 123. Tietze-Conrat, Erika. Mantegna: Paintings, Drawings, Engravings (London: Phaidon Press, 1955), p. 192, pl. 150. Cipriani, Renata. Tutta la pittura del Mantegna. 2nd ed. (Milan: Rizzoli Editore, October 1956), pp. 32, 81, fig. 169. Cipriani, Renata. Tutta la pittura del Mantegna. 1st ed. (Milan: Rizzoli Editore, June 1956), pp. 31, 81, fig. 169. Cipriani, Renata. All the Paintings of Mantegna. 2 vols. (New York: Hawthorn Books, Inc., 1963), vol. 2, p. 101, pl. 169. Cipriani, Renata. All the Paintings of Mantegna. 2 vols. (New York: Hawthorn Books, Inc., 1963), vol. 1, p. 30. Camesasca, Ettore. Mantegna (Florence: G. Barbera, 1964), p. 128. Spriggs, A. I. "Oriental Porcelain in Western Paintings." Transactions of the Oriental Ceramic Society 36 (1965), p. 74, pl. 58a-b. Sweeney, Barbara. Catalogue of Italian Paintings (Philadelphia: John G. Johnson Collection, 1966), p. 47. Bellonci, Maria, and Niny Garavaglia. L'Opera completa del Mantegna (Milan: Rizzoli Editore, 1967), p. 121, no. 106. Berenson, Bernard. Italian Pictures of the Renaissance: A List of the Principal Artists and Their Works with an Index of Places; Central Italian and North Italian Schools. 3 vols. (New York: Phaidon, 1968), vol. 2, pl. 710. Berenson, Bernard. Italian Pictures of the Renaissance: A List of the Principal Artists and Their Works with an Index of Places, Central Italian and North Italian Schools. 3 vols. (New York: Phaidon, 1968), vol. 1, p. 239. Castle Ashby: Home of the Marquess & Marchioness of Northampton (St. Ives: Huntingon, Cambs, 1978), pp. 7, 10, ill.
Lightbown, Ronald. "L'esotismi." In Storia dell'arte italiana. Parte Terza: Situazioni momenti indagini. Vol. 3, Conservazione, falso, restauro (Turin: Giulio Einaudi Editore, 1981), p. 453, fig. 303. Chambers, David, and Jane Martineau, eds. Splendours of the Gonzaga, exh. cat. (London: Victoria and Albert Museum, 1982), pp. 122-23, no. 32, ill.
Ringbom, Sixten. Icon to Narrative: The Rise of the Dramatic Close-Up in Fifteenth Century Devotional Painting. 2nd ed. (Doornspijk: Davaco, 1984), pp. 88, 90-93, 102, 161, 181, fig. 41. "The Sale Room." Apollo 123, no. 282 (August 1985), p. 163, ill.
Christie, Manson & Woods, London. Important Old Master Pictures, Part I. April 18, 1985, pp. 39-44, no. 16, ill.
Art & Auction 7, no. 9 (April 1985), p. 144, ill.
"Reviews, Old Master Pictures." Art & Auction 7, no. 11 (June 1985), pp. 124-25. "Editorial: Raising the Ceiling." Burlington Magazine 127, no. 984 (March 1985), p. 133. "Un Mantegna en Vente." Connaissance des Arts, no. 398 (April 1985), p. 12, ill.
"Le Tableau le Plus Cher." Connaissance des Arts, no. 400 (June 1985), p. 117, ill.
Kaplan, Paul H. D. The Rise of the Black Magus in Western Art (Ann Arbor: UMI Research Press, 1985), p. 279n99. 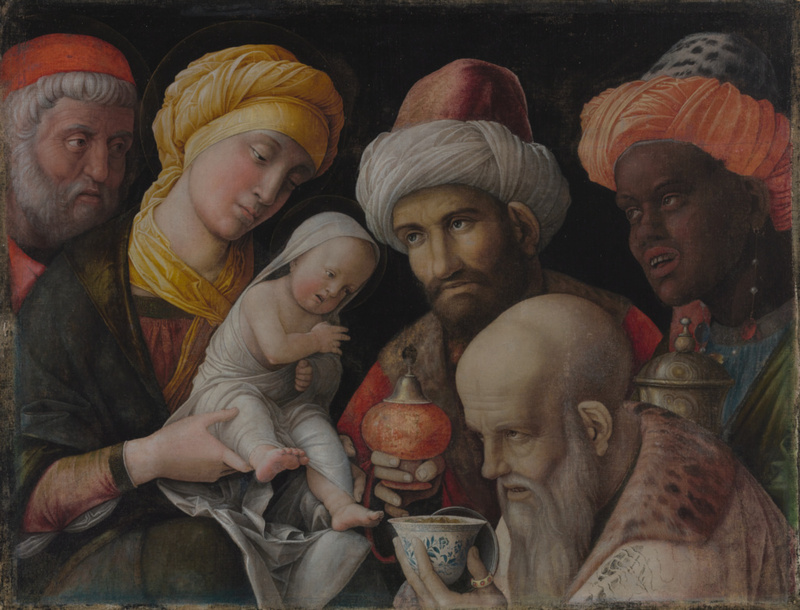 Lightbown, Ronald W. "'The Adoration of the Magi' by Andrea Mantegna." In Christie's Review of the Season 1985 (Oxford: Phaidon with Christie's, 1985), pp. 24-27, ill.
Melikian, Souren. "Year in Review 1984-1985: International Auction Houses." Art & Auction 8, no. 3 (September 1985), p. 80, ill. "Acquisitions/1985." The J. Paul Getty Museum Journal 14 (1986), p. 212, no. 111. Lightbown, Ronald W. Mantegna: The Complete Paintings (Oxford: Phaidon with Christie's, 1986), no. 43, ill.
Davis, Frank. “Both Sides of the Hammer: Personal Memories Over Nine Decades.” Country Life 187 (January 8, 1987), p. 66, fig. 6. Sox, David. Unmasking the Forger: The Dossena Deception (New York: Universe Books, 1987), p. 153n35. Fredericksen, Burton B. Masterpieces of Painting in the J. Paul Getty Museum. Rev. ed. (Malibu: J. Paul Getty Museum, 1988), unpaginated, no. 5, ill.
Martineau, Jane, ed. Andrea Mantegna, exh. cat. (New York: Metropolitan Museum of Art, with Abrams, 1992), pp. 237-38, no. 56, ill., entry by Keith Christiansen. Hayum, Andrew. “A Mantegna for Our Time.” Art in America 80, no. 6 (June 1992), pp. 72-73, 76, ill.
Hirst, Michael. Review of Mantegna. London, New York. Burlington Magazine 134, no. 1070 (May 1992), p. 318. Lightbown, Ronald W. "Mantegna: Great But Little Known." Apollo 135, no. 361 (March: 1992), p. 188. Rothe, Andrea. "Mantegna's Paintings in Distemper." In Andrea Mantegna, exh. cat. Jane Martineau, ed. (New York: Metropolitan Museum of Art, with Abrams, 1992), p. 85. Watson, Peter. From Manet to Manhattan: The Rise of the Modern Art Market (London: Vintage, 1992), pp. 384-86, 388-89. Koch-Hillebrecht, Manfred. Museen in den USA: Gemälde (Munich: Hirmer Verlag, 1992), p. 280, ill.
Sayer, Michael. The Disintegration of a Heritage: Country Houses and Their Collections, 1979-1992. Hugh Massingberd, ed. (Norwich: Michael Russell, 1993), pp. 75, 138, pl. 6. Ferino-Pagden, Sylvia, ed. "La prima donna del mondo": Isabella d'Este, Fürstin und Mäzenatin der Renaissance, exh. cat. (Vienna: Kunsthistorisches Museum, 1994), pp. 386, 388-91, no. 131, ill.
Fredericksen, Burton B., et al. Masterpieces of Painting in the J. Paul Getty Museum. 3rd ed. (Malibu: J. Paul Getty Museum, 1995), unpaginated, no. 5, ill., entry by Burton B. Fredericksen. Jaffé, David. Summary Catalogue of European Paintings in the J. Paul Getty Museum (Los Angeles: J. Paul Getty Museum, 1997), p. 80, ill.
Fredericksen, Burton B., et al. Masterpieces of the J. Paul Getty Museum: Paintings (Los Angeles: J. Paul Getty Museum, 1997), pp. 20-21, no. 7, ill., entry by Burton B. Fredericksen. Walsh, John, and Deborah Gribbon. The J. Paul Getty Museum and Its Collections: A Museum for the New Century (Los Angeles: J. Paul Getty Museum, 1997), pp. 107, 112, ill.
Carr, Dawson W. The Adoration of the Magi (Los Angeles: J. Paul Getty Museum, 1997), pp. 1-13, ill.
Batzner, Nike. Andrea Mantegna (Oldenburg: Konemann, 1998), pp. 108-9, ill.
Candès, Sylvie, et al. Venez voir: Nous somes venues l'adorer (Paris: Le Sénevé/CERP, 1998), pp. 26-29, ill.
Wheeler, Marion. Her Face: Images of the Virgin Mary in Art (Cobb: First Glance Books, Inc., 1998), unpaginated, ill.
Green, Christopher. Art Made Modern: Roger Fry's Vision of Art, exh. cat. (London: Courtauld Institute of Art, with Merrell Holberton Publishers, 1999), pp. 104-5, ill.
Aikema, Bernard, and Beverly Louise Brown, eds. Renaissance Venice and the North: Crosscurrents in the Time of Bellini, Dürer and Titian, exh. cat. (Venice: Bompiani, 1999), pp. 145, 292-93, no. 51, entry by Susanne Christine Martin. Linn, J., Paintings Catalogue (New York, 1999), pp. 107, 100-10, ill.
Livingstone, Marco. "Bill Viola." In Encounters: New Art from Old, exh. cat. Richard Morphet, ed. (London: National Gallery, 2000), p. 318, fig. 13. Félix, Madeleine. I Re Magi (Milan: Jaca Book, 2000), p. 154, ill. The J. Paul Getty Museum Handbook of the Collections. 6th ed. (Los Angeles: J. Paul Getty Museum, 2001), p. 96, ill.
Lüdke, Dietmar, et al., eds. Spätmittelalter am Oberrhein: Maler und Werkstätten, 1450-1525, exh. cat. (Stuttgart: Jan Thorbecke Verlag GmbH & Co. und Karlsruhe: Staatliche Kunsthalle, 2001), pp. 420-22, no. 250/2, entry by Ariane Mensger. Walsh, John, ed. Bill Viola: The Passions (Los Angeles: J. Paul Getty Museum, 2003), pp. 31-33, fig. 7. Zuffi, Stefano. Gospel Figures in Art. Thomas Michael Hartmann, trans. (Los Angeles: J. Paul Getty Museum, 2003), p. 89. Allen, Denise, et al. Masterpieces of Painting in the J. Paul Getty Museum. Rev. ed. (Los Angeles: J. Paul Getty Museum, with Thames & Hudson, 2003), pp. 22-23, no. 8, ill., entry by Burton B. Fredericksen. de Nicolò Salmazo, Alberta. Andrea Mantegna (Milan: Rizzoli/Skira, 2004), pp. 218-19, 252, fig. 74. Kaplan, Paul H. D. “Isabella D’Este and Black African Women.” In Black Africans in Renaissance Europe. Thomas Foster Earle and Kate J. P. Lowe, eds. (Cambridge: Cambridge University Press, 2005), pp. 148-49, fig. 32. Pirazzoli-T’Serstevens, Michèle. “Le cèramique chinoise en Italie XIIIe-début XVIe siècle.” In Chine-Mediterranee: Routes et échanges de la céramique avant le XVIe siècle (Paris: Société française d’Etude de la Céramique orientale, 2005), p. 81, fig. 4. Carboni, Stefano, ed. Venice and the Islamic World, 828-1797, exh. cat. (New York: Metropolitan Museum of Art, with Gallimard, 2007), p. 124, fig. 3. Woods, Kim W. "Netherlandish Networks." In Renaissance Art Reconsidered. Vol. 2, Locating Renaissance Art. Carol M. Richardson, ed. (New Haven and London: Yale University Press, with The Open University, 2007), pp. 95-97, pl. 2.29. The J. Paul Getty Museum Handbook of the Collections. 7th ed. (Los Angeles: J. Paul Getty Museum, 2007), p. 91, ill.
Stoppa, Jacopo. The Timeline Book of Mantegna (Bergamo: Tecnoprint, with Antique Collectors Club, 2008), unpaginated, no. 13, ill.
Galansino, Arturo. Mantegna: L'album de l'exposition (Paris: Musée du Louvre Editions, with Hazan, 2008), pp. 44, 46, fig. 37. Agosti, Giovanni, and Dominique Thiébaut, eds. Mantegna, 1431-1506, exh. cat. (Paris: Musée du Louvre, with Hazan, 2008), pp. 411-12, no. 181, ill. entry by Sergio Momesso. Romani, Vittoria. "Vers la 'manière moderne'." In Mantegna, 1431-1506, exh. cat. Giovanni Agosti and Dominique Thiébaut, eds. (Paris: Musée du Louvre, with Hazan, 2008), p. 406. Agosti, Giovanni. "Mantegna 2046." In Mantegna, 1431-1506, exh. cat. Giovanni Agosti and Dominique Thiébaut, eds. (Paris: Musée du Louvre with Hazan, 2008), p. 52. Furlotti, Barbara, and Guido Rebecchini. The Art of Mantua: Power and Patronage in the Renaissance. A. Lawrence Jenkens, trans. (Los Angeles: The J. Paul Getty Museum, 2008), p. 63, ill.
Roth, Martin, Harald Marx, and Michael Brand. "Foreword." In Captured Emotions: Baroque Painting in Bologna, 1575-1725, exh. cat. Andreas Henning and Scott Schaefer, eds. (Los Angeles: J. Paul Getty Museum, 2008), p. vii. Sallay, Dóra, Vilmos Tátrai, and Axel Vécsey, eds. Botticelli to Titian: Two Centuries of Italian Masterpieces, exh. cat. (Budapest: Szépművészeti Múzeum, 2009), pp. 152-53, no. 17, ill, entry by Peter Humfrey. Tátrai, Vilmos. “The Science of Painting.” In Botticelli to Titian: Two Centuries of Italian Masterpieces, exh. cat. (Budapest: Szépművészeti Múzeum, 2009), p. 118. Salvy, Gérard-Julien. Cent énigmes de la peinture (Paris: Èditions Hazan, 2009), pp. 96-97, ill.
Sargent, William R. "Five Hundred Years of Chinese Export Ceramics in Context." In Treasures of Chinese Export Ceramics from the Peabody Essex Museum, exh. cat. William R. Sargent and Rose Kerr, eds. (Salem: Peabody Essex Museum, with Yale University Press, 2012), pp. 4-5, fig. 5. Clunas, Craig, and Jessica Harrison-Hall, eds. Ming: 50 Years that Changed China, exh. cat. (London: British Museum, 2014), pp. 11, 292-93, 307, no. 263, fig. 263. Suchomel, Filip. 300 Treasures: Chinese Porcelain in the Wallenstein, Schwarzenberg & Lichnowsky Family Collections. John Comer, trans. (Prague: Academy of Arts, Architecture and Design, 2015), pp. 14-15, fig. 6. Gamwell, Lynn. Mathematics + Art: A Cultural History (Princeton: Princeton University Press, 2016), pp. 212-13, figs. 5-11. Hindlip, Charles. An Auctioneer's Lot: Triumphs and Disasters at Christie's (London: Third Millenium Publishing, 2016), pp. 136-39. Christian, Kathleen, and Leah R. Clark, eds. Art and its Global Histories: European Art and the Wider World, 1350-1550 (Manchester: Manchester University Press, 2017), pp. 45, 106, 168, pl. 3.4, cover ill.